Thanks to a roadtrip offer by Peter Moran, we have personalized handling of our homebrew competitions entries for America’s Finest City Competition to Alesmith Brewing Co. But, you must drop off your entries to me (Carl) no later than Thursday, January 24th. Registration is open at https://quaff.org/AFC-2019/ . 2 bottles are needed for each entry, but if you throw in a 3rd bottle, Peter will make sure it gets extra special handling! Carl’s Address: 3621 Redwood, LA 90066. On Thursday night, I’ll be at Los Angeles Ale Works from 7:30 to 9:00 PM, so if you like swing on by and hand them to me in person. If you miss the Thursday deadline, you can still ship your bottles to AleSmith Brewing Company 9990 AleSmith Ct, San Diego, CA 92126 no later than January 31st. Keep things cool to lager my beer. With a new year upon us, I hope you are taking advantage of the cool winter weather to get some fresh batches of beer going. I’m currently working on a “garage lager”. At some point, it will need to go into the beer fridge, but in the meantime, the garage is holding it at a steady 54 degrees. Also in the works is an “aquarium heater ale”, kept at a comfy 72 degrees, despite a rather chilly house temperature. Our next club meeting is right around the corner. We have some important club business to discuss with all members (see below), so please attend if you can. Education: In the second of a series, Carl will be demonstrating how water chemistry affects the taste of your homebrew, and how you can fine tune your H2O to the style you are brewing. Commercial Style of the Month: European Pale Ales. Homebrew Style of the Month: European Pale Ales, and any home-brewed IPA. As we advised previously, Tim Bardet is retiring as Treasurer. Also, President Michael Musgrave recently started a new position that is sure to take up significant amounts of his time. That is one firm opening (Treasurer), and a potentially provisional opening (President). We will solicit nominations at the October meeting, or you can present our nomination via email to the board (board @ pacific gravity . com). 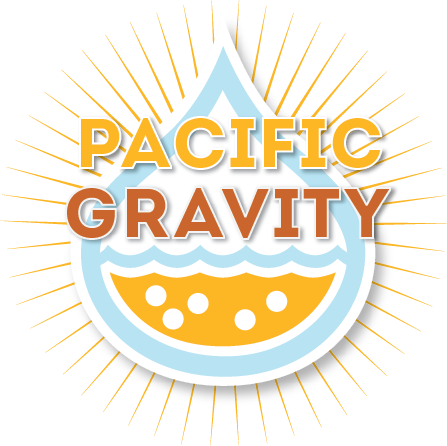 Nominations are being accepted for the Pacific Gravity member that you think has gone above and beyond helping P.G. be the great home brewers club that it is. Please raise your nomination at the October meeting, or by email to the board (board @ pacific gravity . com) . Voting will be held at the November meeting. This is no Trick, but definitely a Treat .. our next club meeting will be held at an exciting new venue: PG Member Joe Kovach’s “new” brewery, Tortugo Brewing Company. Joe has some tasty beers on tap, and has some pretty interesting plans for future beers and expansion. We will also be finalizing the board member election slate of the 2019 P.G. Board (see below for nomination info). Hyde Park Blvd is a few blocks East of Three Weavers, and around the corner from iconic Randy’s Doughnuts. From La Cienega and Florence, go east on Florence about 1/4 mile, turning left at the first street. Go under the metro rail tracks, proceed to the big orange building on the East side of the street. EDUCATION HIGHLIGHT: In the second of a series, Carl will be demonstrating how water chemistry affects the taste of your homebrew, and how you can fine tune your H2O to the style you are brewing. And whatever Joe Has On Tap. If you are keeping score, that is one firm opening (Treasurer), and a potentially provisional opening (President). Please consider volunteering your nomination, either by emailing the board (board @ pacific gravity . com) or by voice at the October meeting. Nominations will be accepted for all elected board positions. Do you think one of your fellow Pacific Gravity members has gone above and beyond helping P.G. 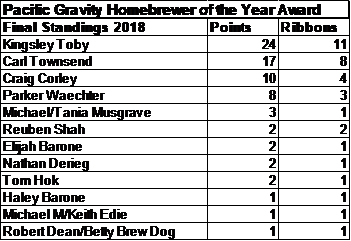 be the great home brewers club that it is? If so, please be sure to nominate him/her at the October meeting, or by email to the board. Yorkshire Square is on Van Ness, just North of Torrance Blvd.. Date: TBD: Nov. 10 or Nov 17. As has been our practice in the past couple of years, we will combine the Chili Cookoff with the November Club Meeting. It will be on either the 2nd or 3rd Saturday of November. We haven’t worked out all the details yet – get your chili recipe ready! AND!! WE WILL BE ELECTING FOR THE 2019 PACIFIC GRAVITY BOARD!! Remember: Bring some of your homebrew to the meeting and events.